Yep, that's how long it took today to make a lovely collection of 20 hand crafted, hand blown Easter eggs with Claire! It's one of those traditions that we're still doing because it means something to her...she's definitely our "tradition" girl! We've discovered a few tricks along the way - like who's good at blowing the eggs (me) and who is good a working with the dye (Claire). But we both take turns designing eggs and have a great time together doing it. At the end we both said, "Wow...that was a lot of work for 20 eggs!!" But the time and memory with Claire? Priceless!! Claire must get that from Mom. 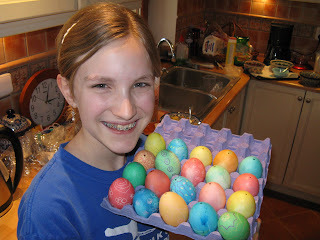 She stayed up past midnight on Easter-eve to make a pretty and colorful bowl of Easter eggs. The apple (or egg in this case) didn't fall far from the tree! What beautiful eggs! Good job and what a fun tradition to do together! 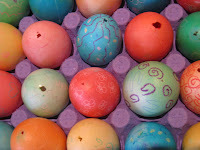 One thing we do is the weeks before Easter, every time we use an egg, we blow it out- soon we have lots of eggs available for painting and you don't have to do it all at once!